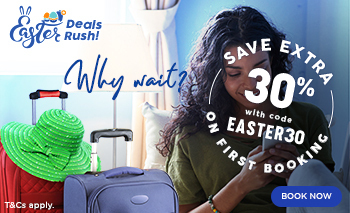 Easter is nigh and Jumia Travel brings you the best Easter packages for your holiday. Our Easter egg basket comes bearing packages to the mighty Mount Kenya, the serene Diani and Nyali Beach, Queen Elizabeth and Lake Mburo National Park in Uganda, Dubai as well as Egypt. Here are top packages you can enjoy. While in Kenya, you will not be short of places to visit for your Easter break. Book any of our daily departures to experience the Mara, or if you are looking for a beach experience, get on board to the Serene Bamburi Beach. A break to Lake Naivasha and Lake Nakuru is on full board basis, transport included courtesy of Jumia Travel. With this deal, you will enjoy viewing hippos and flamingos at Lake Nakuru and hiking, biking, camping and wildlife viewing at Hells Gate. Uganda, the pearl of Africa, has awesome packages for an Easter weekend break for couples. For starters, you could go for a weekend getaway at the Kipling Lodge, situated about 20 minutes from Jinja. The package includes swimming, bird watching, vintage boat ride and games. Another fun break would be at Chobe Safari Lodge, overlooking the Nile. This getaway is perfect for adventure and relaxation as you enjoy panoramic views of the Nile. Apart from these lodges, Uganda easter packages feature a great escape to Ssese Island, Lake Bunyonyi, Lake Mburo National Park and Queen Elizabeth National Park. Dubai is a dazzling city in the UAE. It boasts of malls, marine parks and state of the art buildings such as Burj Khalifa. Touring Dubai in Easter is a brilliant idea as Jumia offers holiday packages you simply cannot resist. Our package includes return tickets from Nairobi to Dubai or Entebbe to Dubai, city tour, dhow cruise, desert safari with barbeque dinner and belly dancing show and accommodation. With this crazy Easter deal, you can relax in Dubai with your partner, family, or even friends this Easter. Have you thought of visiting the home of the Great Pyramids? Egypt is an enchanting destination to visit all year round. It is full of historic sites such as the Great Sphinx, Valley of Kings and Saadian Tombs among other top attractions. This Easter, Jumia extends an offer of discovering Egypt’s capital Cairo. Each day will be filled with adventure including a visit to the Pyramids of Giza, Temples of Kom Ombo and Edfu, Luxor and the Nile. Take advantage of our crazy Easter packages for the time of your life!